We are also very proud to be Worcester Bosch accredited installers meaning we are able to give our customers up to a 10 year parts and labour guarantee. Can't recommend Fabian enough. 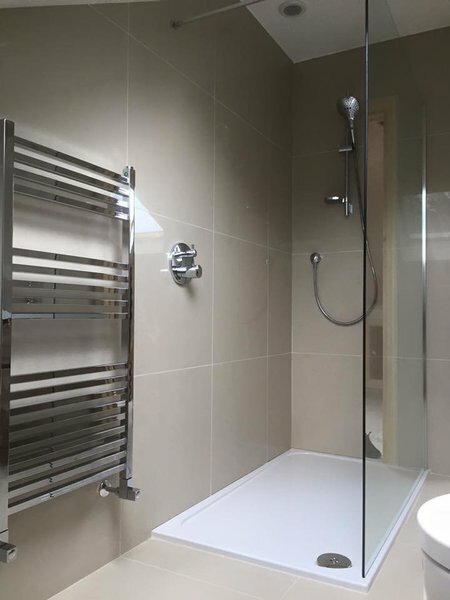 He completely transformed our bathroom, including removing an airing cupboard, relocating the central heating, organising full tiling of the bathroom, fitting a shower enclosure, bath and basin and fitting a relocated W.C. He then went on to sort out our downstairs shower room and change it into a cloakroom with storage. Fabian had excellent communication throughout and was polite, tidy, trustworthy and his work is of an excellent standard. He was very reliable and always arrived on schedule. We are absolutely delighted with our new bathroom. He quickly resolved any issues we encountered along the way (mostly due to the equipment we had ordered) and had a team of helpers at his hand to ensure there were expertise available for every aspect of the job - plumbing, heating, building work, tiling and carpentry. I would not hesitate in recommending Fabian to anyone considering any plumbing or heating work or for a complete bathroom makeover. Fabian was extremely helpful whilst doing the changeover keeping me well informed regarding various decisions on the siting of the new boiler, pump and controls. Since the weather was pretty cold at the time, he managed to keep the old system running so that the period when the house was without heating was quite short. The pipework needed to change the boiler position from the kitchen to the garage to gain an outside wall for the boiler flue is very neatly installed in the garage eaves and well lagged.The condensate waste is connected to the washing machine drain to eliminate the general problem associated with a frozen pipe reported by many of my friends. Finally all the waste was collected and sorted into recyclable and non-recyclable components and taken away. The job was completed very competantly to the quoted price and I would not hesitate to recommend this company again. I have been a Which member for 45 years and think the Trusted Traders scheme is a great asset. Fabian did a great job throughout. 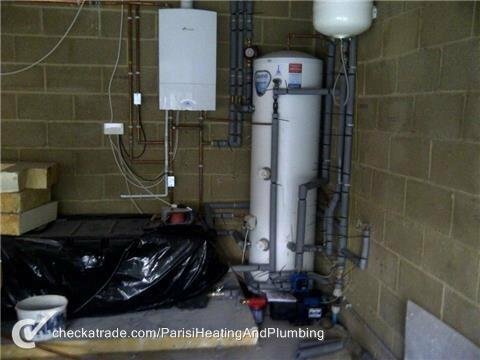 New boiler, tanks, radiators, pump & shower. I had delays through my gas provider but Fabian worked around this to get me connected ASAP. I would happily recommend Parisi plumbing & heaing to anyone. Fabian arrived at 07.45 to install Worcester Bosch new boiler. Work completed to a very high standard and he left at 13.15. He is very efficient, neat, tidy, personable and knowledgeable with all modern developments. We highly recommend him and have future work lined up for him. A**********tradesman. I had a strong recommendation from JK Floorheating for Parisi Plumbing. I rang them and Fabian was at my house the following morning (Saturday) to quote. By 15:00, he'd sent the quote to me which was very competitive and fit neatly into my timeframe. He installed a new Combi boiler and removed the radiators. Fabian is neat and tidy and shows up when he says he will. He is friendly, polite and highly professional and knowledgeable. Finally, I've found a plumber that I can trust! I could not recommend this service highly enough; charming, efficient, tidy and courteous - the price was the price...what more could you want!